The Victoreen 710-104 ionization chamber specs say it produces 1 pA in a 100 mR/h gamma environment, which suggests the actual current will be much, much lower in the Basement Laboratory. In fact, I’m hoping to spot individual gamma rays, rather than the overall radiation background current, which will involve counting groups of electrons as they march by. The simplest possible electrometer amplifier, an MPSA14 NPN Darlington, produced 25 nA of current that, assuming a gain of 10 k, corresponds to an unrealistically high 2.5 pA of chamber current and is, realistically, entirely leakage current. 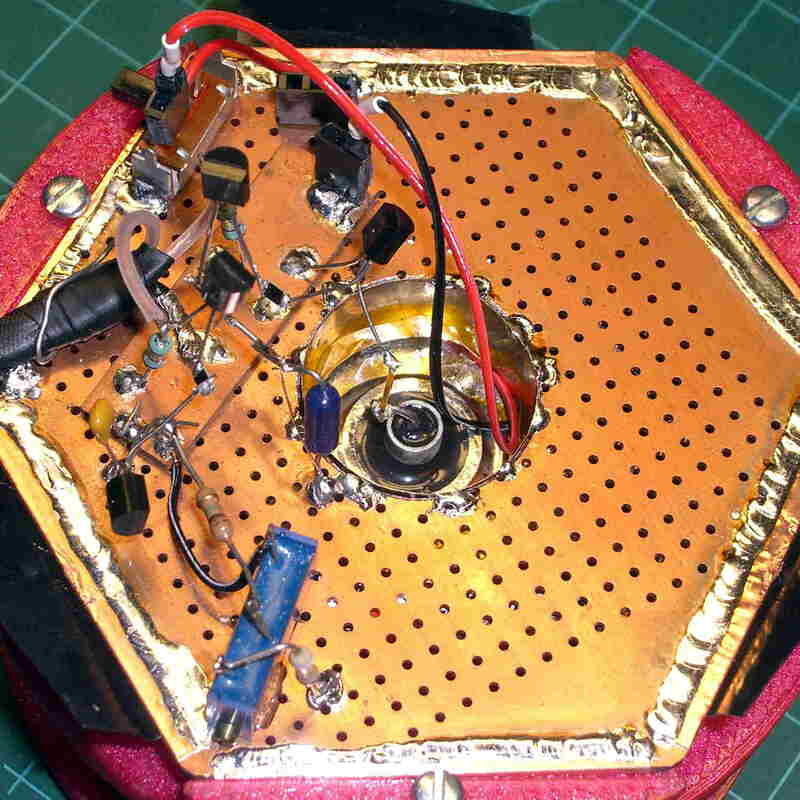 The blue trimpot in the foreground drives the base of a duplicate pair of transistors in a misguided attempt to make a differential amp that would balance out some thermal effects. Turned out to be not worth the effort, due to the adjustment’s fiddly nature, but also not worth unsoldering the parts. The black lump covers two RG-174 coaxial cables that run off to the oscilloscope; they already had BNC connectors on the end and were small enough for the job. The output idles at 6.5 VDC → 550 μA of Q101 collector current → 6 pA of Q102 base current. Yeah, right. Grounding the base of Q102 → 5.9 V output → 500 µA → 50 nA leakage into Q102’s collector. Maybe. 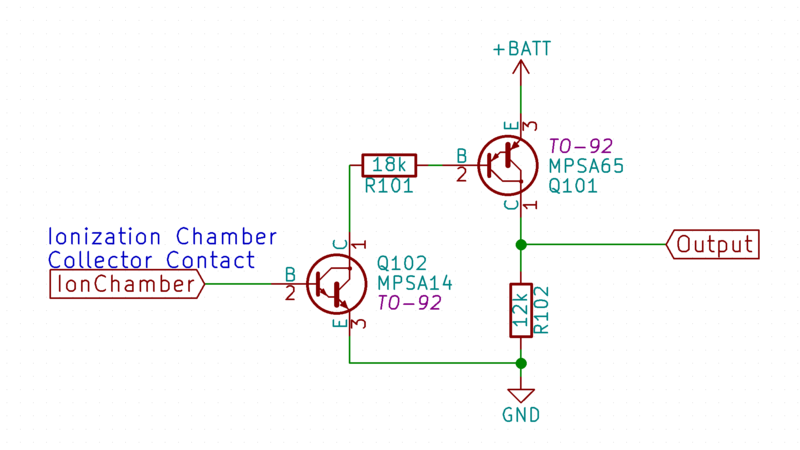 Shorting Q101’s base to its emitter produces 350 mV at the output → 30 µA of output current. Huh. After restoring the status quo ante, the output idled at 10.2 V. See previous comment about thermometers, modulo soldering transistor leads. So, given the predictably absurd temperature sensitivity of this whole lashup, it’s reasonable to say the entire DC output current comes from leakage, which also agrees with the fact that I’m not dying of gamma exposure. In point of fact, an ancient CDV-715 Radiological Survey Meter with a similar ionization chamber (which, at this late date, passes its “circuit test” function and seems to be perfectly happy) reports exactly zero background on its most sensitive 500 mR/h scale.